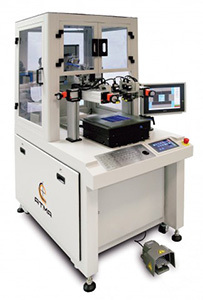 Specially designed for electrode printing on silicon wafers (both mono and multicrystalline) for the green energy industry. Minimizes breakage rate for thinnest wafers (< 200µm) with digitally adjusted air pressure equalization to control printing and parallel transportation mechanisms. Uses German IPC and programming module with colored touch-sceen interface to set operational function parameters throughout the production line for optimal process control. Up to 100 different groups of presets may be individually named and numbered for fast, easy setup and for consistent, standardized production management. Complete line is covered by clean booth for the best combination of safety and clean work environment. Interlock system stops all movement when door is opened or when emergency stop button is pressed, triggering sound and light warning alarms for operator safety. Screen cleaning function to protect operator safety prevents all manual or mono operation while cleaning feature is engaged. Designed for Ag/Al/AgAl paste electrode printing. Uplift structure uses German STAR Ballscrew and Japanese VR Guide Rail with Mitsubishi servo motor. Single screen frame size uses link flange and frame locked by pneumatic pins for fast stencil replacement. Stencil displacement system uses German STAR Ballscrew and guide rail with servo motor to achieve highly accurate registration. Table structure includes embedded CCD camera and LED light source module to pick up image for automatic registration. Vacuum system seals wafer to table top throughout print cycle. 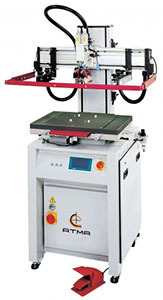 Print-head/flood-coater are driven by servo motor with linear guide rail. Digital presets control speed and stroke for extremely stable and consistent production runs. Linear guide rail features a state of the art strong and rigid aluminum extrusion profile with precise machining for the highest accuracy in assembly and calibration. Composed of registering and printing section, shuttle table for convenient loading to increase throughput. Specially designed frame holder for quick screen positioning. Easily adjusted squeegee angle, depth, level, and printing pressure. Slightly conical registration pins pluss suction pop-up pins for easy breakage-free manual loading of wafer substrates. Printing section contained within clean booth for best combination of safety and work environment. Equipped with CCD vision system for high precision registration. HMI system for various functions, with digital control and error diagnosis. Cantlilever concept with upgraded digital controls. Motor driven printing / screen uplift along linear guide rail for stable quiet smooth movement, with digitally-set printing stroke/speed. Easy to adjust squee3gee angle, depth, level, and printing pressure. Highest quality exchanger system with up to 8 wafer cassette. 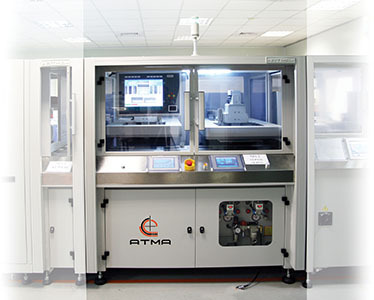 Utilizes robotic armature for parallel transportation and fast, accurate positioning of wafer. Sensors detect verify correct cassette placement, alarm alerts operator of incorrect alignment. Used to examine wafers for breakage, micro-cracks, and disconnection. Enables automatic rejection of defective product, lowering labor cost through fully automatic operation. Displays microscopic details with Japanese CCD camera with high resolution magnification lens and LED backlighting for easy inspection and quality control. High efficiency IR emitter heating. Three sections PID digital temperature control with SCR rectifier for precise curing. High quality stainless steel conveyor belt.